Guinea is at a turning point after decades of authoritarian rule since gaining its independence from France in 1958. Guinea held its first free and competitive democratic presidential and legislative elections in 2010 and 2013 respectively. Alpha CONDE was elected to a five-year term as president in 2010, and the National Assembly was seated in January 2014. CONDE's cabinet is the first all-civilian government in Guinea. Previously, Sekou TOURE ruled the country as president from independence to his death in 1984. Lansana CONTE came to power in 1984 when the military seized the government after TOURE's death. Gen. CONTE organized and won presidential elections in 1993, 1998, and 2003, though all the polls were rigged. Upon CONTE's death in December 2008, Capt. Moussa Dadis CAMARA led a military coup, seizing power and suspending the constitution. His unwillingness to yield to domestic and international pressure to step down led to heightened political tensions that culminated in September 2009 when presidential guards opened fire on an opposition rally killing more than 150 people, and in early December 2009 when CAMARA was wounded in an assassination attempt and exiled to Burkina Faso. A transitional government led by Gen. Sekouba KONATE paved the way for Guinea's transition to a fledgling democracy. 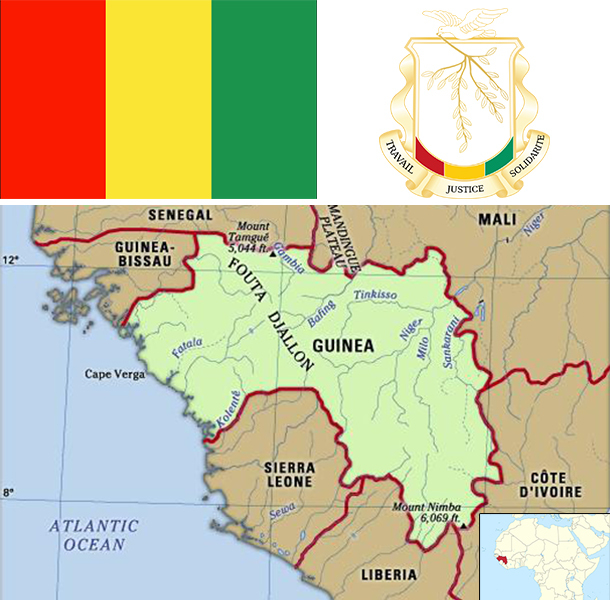 Guinea is a poor country of approximately 11.7 million people that possesses the world's largest reserves of bauxite and world’s largest untapped high-grade iron ore reserves (Simandou), as well as gold and diamonds. In addition, Guinea has fertile soil, ample rainfall, and is the source of several West African rivers, including the Senegal, Niger, and Gambia. Guinea's hydro potential is enormous and the country could be a major exporter of electricity. The country also has tremendous agriculture potential. Gold, bauxite, and diamonds are Guinea’s main mineral exports. Following the death of long-term President Lansana CONTE in 2008 and the coup that followed, international donors, including the G-8, the IMF, and the World Bank, significantly curtailed their development programs in Guinea. However, the IMF approved a new 3-year Extended Credit Facility (ECF) arrangement in 2012, following the December 2010 presidential elections. In September 2012, Guinea achieved Heavily Indebted Poor Countries (HIPC) completion point status. Future access to international assistance and investment will depend on the government’s ability to be transparent, combat corruption, reform its banking system, improve its business environment, and build infrastructure. In April 2013, the government amended its mining code to reduce taxes and royalties. In September 2013, legislative elections were held and the National Assembly was seated in January 2014. In 2014, Guinea also complied with requirements of the Extractive Industries Transparency Initiative by publishing its mining contracts and was found to be compliant. International investors have shown interest in Guinea's unexplored mineral reserves, which have the potential to propel Guinea's future growth. The biggest threats to Guinea’s economy are political instability, the continuation of the Ebola epidemic, and low international commodity prices. Rising international donor support and reduced government investment spending will lessen fiscal strains created by the Ebola epidemic, but economic recovery will be a long process while the government continues to fight the disease. As of March 2015, Guinea had approximately 3,200 confirmed and suspected cases of Ebola with over 2,100 deaths (65.6% mortality rate). The economic toll of Ebola on the Guinean economy is considerable. Ebola stalled promising economic growth in 2014 and unless the epidemic ends in 2015, the economy will continue to stagnate. Normal economic growth has not returned and several projects have stalled, such as offshore oil exploration and the giant Simandou iron ore project. Promising reductions in Ebola cases in the first half of 2015 could see Guinea turn the corner on the disease and have Ebola eradicated later in the year. The 240 Megawatt Kaleta Dam is expected to be commissioned in late June or early July 2015 and President Alpha CONDE’s administration has stated that Conakry will have full time electricity once Kaleta comes online. Currently the capital only receives six to eight hours of electricity per day. Although the recent political stability has brought renewed interest in Guinea from the private sector, an enduring legacy of corruption, inefficiency, and lack of government transparency, combined with fears of Ebola, continue to undermine Guinea's economic viability. Successive governments have failed to address the country's crumbling infrastructure, which is needed for economic development. Guinea suffers from chronic electricity shortages; poor roads, rail lines and bridges; and a lack of access to clean water continue to plague economic development. Presidential elections are scheduled for October 2015 and investors are cautiously awaiting the outcome. Guinea is a new democracy and past election violence as well as Ebola may keep investors on the sideline until 2016. The Guinean government, led by President CONDE, is working to create an economy to attract foreign investment and hopes to have greater participation from western countries/firms in Guinea's economic development.